Asma Hanif (right). Photo taken by photographer Antar Hanif. After occupying a top floor unit in an abandoned Baltimore building for nearly a year, Asma Hanif got a bitter taste of what it’s like to be homeless. People living with addiction health issues frequented the building to acquire drugs and other substances, while Hanif and her young children would go about their day-to-day activities floors above with no lock on their door. While this was a dangerous circumstance, Hanif says her only issue with the men downstairs engaging in substance dealings came when she had to maneuver over them upon entering and exiting the building. Born in Virginia and raised in North Carolina, Hanif was the daughter of two Black parents who lived in the the United States during a time when racial tension was far more prevalent than it is even today. She called the projects her home, and she witnessed the blatant mistreatment of people who shared her skin color throughout her life. That was the first of three occurrences in her life that Hanif credits for her pursuing her line of work today. The second came in ninth grade, when her grandmother battled a cancer that resulted in her demise. Hanif’s grandmother worked for a wealthy physician as a maid, a position Hanif says was considered by society to be unimportant and replaceable. When her grandmother felt something in her stomach the size of a pea, she went to the physician only to have her concerns dismissed as nothing. It was at that time Hanif’s future career goals became more defined. “I decided that I wanted to grow up and take care of people like my grandmother—people who no one cared about,” she says. Some years after her grandmother’s death, Hanif enrolled in Howard University with a scholarship. She then went to nursing school, as her mother advised and soon became Muslim. During her schooling, Hanif noticed Muslim women were treated with a similar disregard to her grandmother when they came in to receive care. Promises of female doctors and examiners were not always honored, and for a Muslim woman, this can often feel like a total violation. Hanif then realized she had to start her own practice if she wanted to guarantee a comfortable environment for female Muslim patients. Upon graduating, Hanif opened her private clinic. She had many Muslim women come to her for examinations, and as soon as they got into the room alone with Hanif, they revealed they were victims of domestic violence. Hanif says there was at least one victim per week, sometimes two or three. She continued to call the women back in so they could escape from their abusive homes. “I realized I was just putting a band-aid on a major problem,” Hanif says. Photo taken by photographer Antar Hanif. This was the third occurrence of three that led Hanif to where she is today: running a shelter exclusively for homeless Muslim women called Muslimat Al-Nisaa in Baltimore. The wisdom behind an exclusive space for Muslim women is that Hanif can freely establish an Islamic environment comfortable for the demographic, as this type of accommodation does not exist elsewhere. One Muslim woman even told her she was denied services from a Catholic shelter that falsely stated Islam allows men to beat their wives so unless she left Islam, she could not benefit from their services. 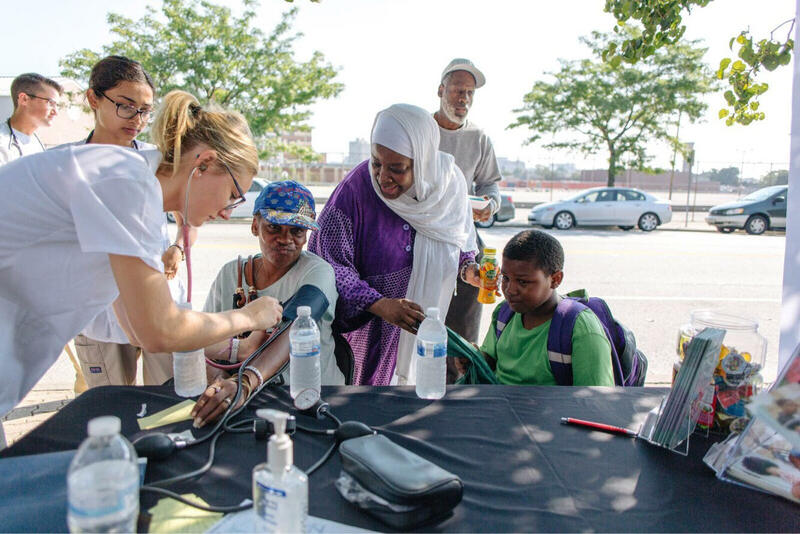 Early on in her endeavor with the shelter, Hanif was able to finance Muslimat Al-Nisaa through her work as a nurse practitioner. However, as time went on and more women needed her help, she had to turn to the Muslim community for donations, as she could no longer both work and manage the shelter. Today, the non-profit runs solely on donations and houses only half the women it can hold due to numerous financial strains resulting from a lack of adequate funds. Hanif herself inhabits the home because she is unable to simultaneously afford her own dwelling and care for the women in the shelter. Over the years, Hanif has grown tired of asking her Muslim community for help. She often finds herself brushed off or untrusted. There are people who donate money, but not nearly enough comes in to sustain the shelter at its full potential. While she doesn’t turn to non-Muslims for financial assistance, if there are some willing to donate to the shelter because they think it’s a good cause, she will gratefully accept. Hanif believes it’s the Muslim community’s responsibility to “step up to the plate” and care for their needy, but she admits it’s a big struggle to come by sufficient donations. Instead, Muslimat Al-Nisaa receives unwanted items like torn clothing, broken household goods, and unhealthy canned foods. This is the biggest problem the women in the shelter face—the lack of support from their community. However, Hanif says some of the women themselves may not realize this because she doesn’t let them see the struggles she faces in garnering donations. For example, when she mans a booth at an Muslim convention, she won’t let the women in the shelter come along so they won’t see the people who ignore her table or those who part with just a single dollar. Sometimes some of the women think it is Hanif’s decision to refrain from raising the heat a little higher or not keeping a landline in the home, but in actuality, the funds are simply not there. Hanif says she wants the women in the shelter to be able to associate happily with the Muslim community upon their exit from the shelter after they become self-sufficient. If they have a sour taste in their mouth from the community at large, Hanif worries they’ll separate themselves from their fellow Muslims or eventually leave the religion all together. That’s why she is willing to take the blame for the lack of amenities in the shelter. She knows Islam emphasizes caring for the needy, even though some Muslims don’t practice it very well. One naturally wonders, why even continue such a thankless, tiresome, and draining lifestyle? A certain kind of heart is needed to put oneself last only to lift up others. That heart belongs to Hanif, a woman who saw the struggles of growing up in the projects, being homeless, caring for her brother with HIV then losing him, in addition to losing her grandmother and mother, and still wholeheartedly looking after women who are victims of domestic violence. If more people had hearts like that of Asma Hanif, maybe those women she houses would find themselves free of domestic violence. If more people had her heart, maybe Muslimat Al-Nisaa would have enough money to turn up the heat and install a landline phone. If more people had her heart, it’s guaranteed the world would be a better place. Readers interesting in learning more and making a donation, can visit this link.